Finally, I've managed to schedule the second friday night fright! woohoo! ....ok, technically the fight got scheduled because while putting off the Great Value review I wound up picking up the Friendly's sundae cup. One could also argue that this isn't a truly fair fight because while Walmart's Great Value sundae cups are $1.00 everyday, Friendly's Sundaes To-Go are only a dollar when they are on sale. Well, sometimes life isn't fair. If you're gonna sit on the shelf with the competition, then you have to be ready for a throw down. In the red corner, weighing in at 124 grams (6 fl oz), we have Friendly's Limited Edition Chocolate Chip Cookie Dough Sundae To-Go. He's known as the vanilla ice cream with cookie dough & chocolate chips, covered with fudge, whipped topping & chocolate chips. Friendly's has spared no expense on their very attractive red packaging. There are little cookie dough balls flying everywhere. If you are looking for a potentially tasty single serve sundae, this might be hard to pass by. My only complaint is that it's a drawing and not real ice cream. Walmart has spared ....well, they seem to have spared some ink with a very bland and simple bright white container for their sundae cup. They do show a spoon scooping a tasty looking serving, but that's it. Ok, Walmart throws the first punch here ...and it's kinda weak. Culinary Circle spoiled me with a thick layer of pb cups on their sundaes. I open this and I can count how many pb cups are on top ...it's 20 in case you are curious. I know it's only a dollar sundae...but...well ...the container makes it look like I'm going to get more than I do. Also, the fudge doesn't even cover the entire top of the treat, and that just seems so cheesy. Actually, the fudge looks kinda hard. Friendly's fights back ...and throws ...something. 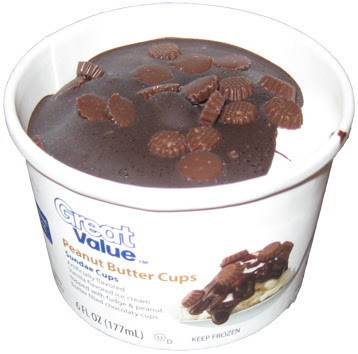 Actually, I opened the container before I read the description and I thought that mound in the middle was ice cream. This frightened me because it was bleach white. Thankfully, it's a small dollop of whip cream, the real ice cream is underneath. It would have been nice to see a few more chocolate chips scattered around, especially considering their size, though had they been spread out more instead of grouped together then I probably wouldn't have even worried about it. At least the fudge covers the ice cream, and it looks like it's already melting. 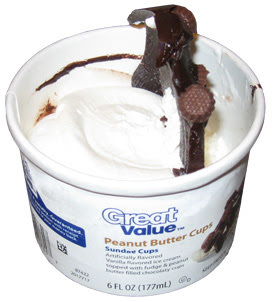 I throw a right scoop into the walmart sundae...and oh, oh, it's fighting me. What is going on? Man this fudge shell is hard. Instead of scooping, it's cracking and causing trouble. In fact, at one point the fudge shell actually pulled off the ice cream and stood straight up (as you can see in the picture below). I worked through it anyway and was greeted by some boring ice cream. It's ok, I've had worse, but it's nothing to write home about. The shell really is annoying, and it doesn't taste like fudge at all, it tastes like cheap chocolate frosting, and I mean that literally, not figuratively. The pb cups are so-so. At leasts they aren't bland, but they still don't add much to the sundae. I'm bored, just bored, even at a dollar. Time for Friendly's to finish off its competitor once and for all. 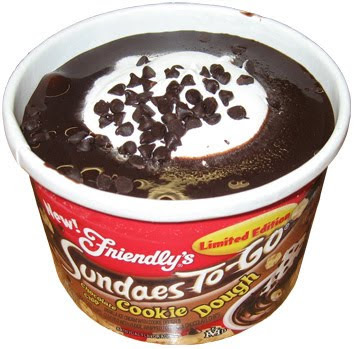 Now, keep in mind that I've had Friendly's Sundaes To-Go before and haven't been particularly impressed. Today is no exception, but compared to Walmart, Friendlys is much better. 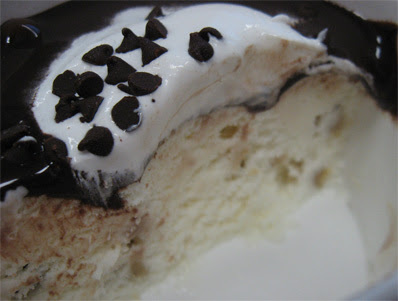 The ice cream is more like a typical vanilla ice cream, but it's still not quite right, the texture makes it feel cheap. Friendly's makes good ice cream so I'm not sure what they did to mess up their own stuff here. Here's a winnning point - The fudge tastes like fudge! it's a miracle! It's not super high quality, but it's somewhat fluid and tastes like fudge, so it will do! 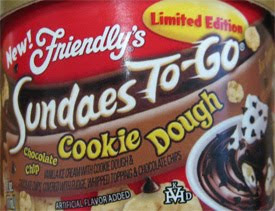 I do have a bone to pick with Friendlys: the container shows chocolate chips in the sundae, but they were only on top. Just look at the picture and you won't see ANY chips inside the ice cream. Actually, I didn't even really see chips in the cookie dough bits (the little tan spots in the bottom right corner of the image). The bits were small, very soft, and didn't pack a whole lot of flavor. The whip cream is probably the most original thing here and is definitely a welcome touch. I should also mention that the whole Friendly's treat has a nice ratio of ice cream to toppings (fudge & whip cream). I wasn't left feeling like I had missed out on one or the other. You could say the treat felt complete. Oh! We have a knockout here fight fans. While Friendly's isn't great, I'll take it over a Great Value sundae any day, including Sunday. Would I recommend Great Value? No. Would I recommend Friendly's? Sure, why not, as long as it's on sale. It may not be worthy of love and devotion, at the very least it is worth trying. Closing Thoughts? I was going to say its funny, but actually it's sad that both containers misrepresent what is in side. I know they all do it, and I don't expect perfection, but....let's make a better treat shall we? 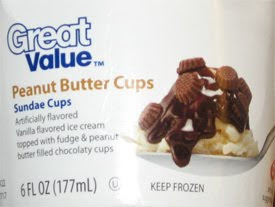 I technically have one more GV sundae in the freezer, but its been there awhile. Sure, I'll still take at least a bite or two before disposing of it if it's freezer burned, but I'm not sure if I will buy anymore. I think there may still be one or two Sundaes To-Go that I haven't tried. I wish they would try just a bit harder with them, so I'm in no rush to try them, but I will get there eventually. Update: This probably wasn't a fair fight. While I've seen the To-Gos go for $1 to $1.25 and then to (I thought) $1.50 ...no, they are actually charging $2 a pop now! That's just crazy and it ain't right.